Many gamers have been concerned about the overabundance of shooters on the market nowadays. However over the last few years, many first person shooters have been released which have been widely regarded as excellent games. 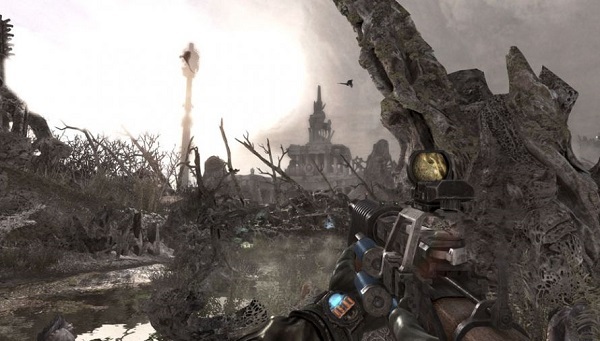 When Metro 2033 was first released by THQ in 2010, 4A Games’ title was seen as a nice change of pace that was held back by a number of small problems. 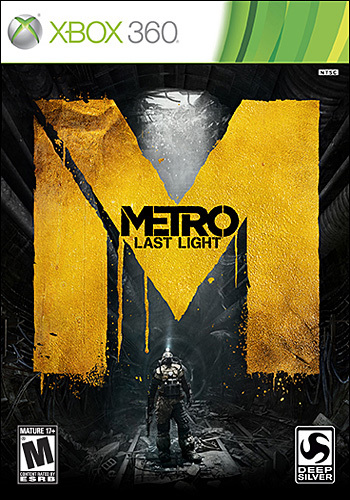 Now, with a new publisher in the form of Deep Silver bringing Metro: Last Light to gamers, will Last Light stand out from the rest? 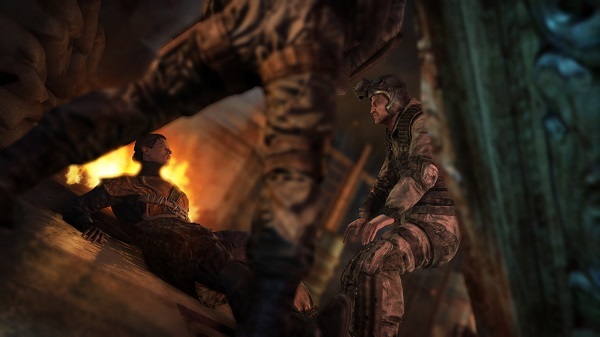 Metro: Last Light places players behind the eyes of Artyom once again, only now he has been fully promoted to the level of a Ranger after the events of Metro 2033. 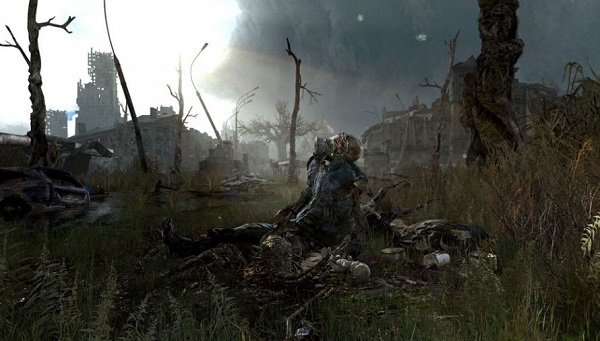 Last Light proceeds forward with the normal ending of 2033 where Artyom used a missile silo to destroy a large “Dark One” nest which had been apparently threatening to destroy the surviving humans in the Metro. However now that some time has passed, it appears that there may be one Dark One still left alive. There had been hints that the surface dwelling mutants had been trying to reach out to Atryom in the past, and now that there is one still left alive players are tasked with tracking it down. However when Artyom is captured and the Dark One is secreted away by an organization with dark intentions, players must track it down even if it means going against the Communist Red Line, the Fourth Reich and numerous mutants to do so. Metro: Last Light’s story is strangely paced and at times it seems more like a rollercoaster than anything else. 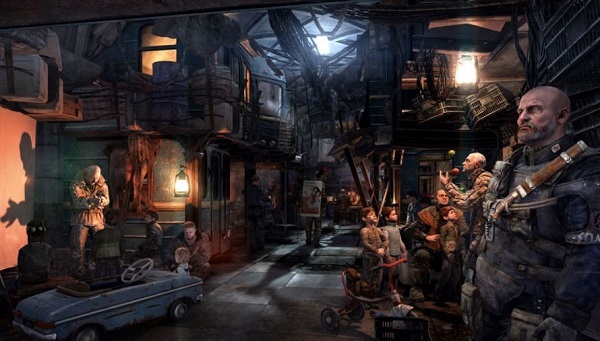 Players are taken along for quite a ride as they venture through the Metro and wasteland of Moscow but the process feels rather disjointed with plenty of shifts in tone and leaps in reasoning. However one thing that Last Light does well is create a living, breathing, terrible world. Keeping an ear open and an eye on the world around you is essential for almost any game, however in Last Light, doing so is quite rewarding. Plenty of side-conversations can be heard through NPCs in civilian areas and even in hostile areas and these snippets not only expand the world but also give narrative to the events around you. Along those same lines, the extensive level of detail to the level design of each area helps tell the story of almost every place the player must venture through. 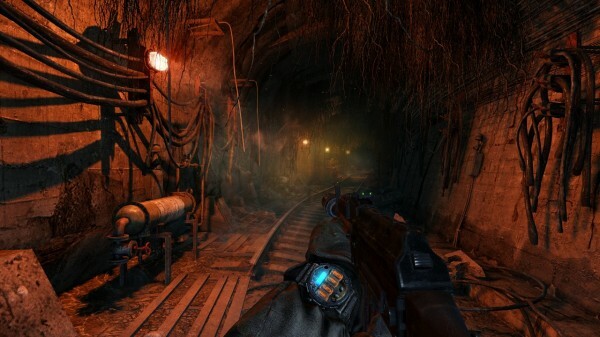 Metro: Last Light may surprise many when they first begin walking through the tunnels of the Metro. When one thinks of a post-apocalyptic shooter full of browns and greys, it tends to mean that it will be run of the mill forgettable. However thanks to some great graphic design and impressive use of dynamic lighting, everything in Metro: Last Light is stellar looking. The various tunnels the player travels through are surprisingly varied but the above-ground sections are where Metro: Last Light’s graphics engine truly flexes it’s muscles as these areas are gorgeously presented. Traveling through the overgrown wasteland of post-apocalypse Moscow, with a gas mask visor which often is covered in grime, rain drops or even blood from mutated enemies, all of which can be wiped off to see better, is an experience that cannot be missed. As mentioned before, there is a large amount of detail to every area’s level design and keeping an eye on the world around you will pay off in spades. Walking through a level and coming across skeletons of the war huddled around one another, frozen in their dying moments, creates a poignant moment in an already grim game. With the amount of side-conversation and main dialogue in Last Light, it is nice to see that 4A Games went the extra mile to make sure that the characters in the game were given great voice actors. Even when playing in English, players are presented characters with thick Russian accents, though if you really want to enhance the experience, shifting to the Russian voice track (with English subtitles of course) adds some nice authenticity to the experience. As for the game’s soundtrack and background noise, it is simply stunning. A game like Metro: Last Light which relies on stealth and offers such great creepy level design requires excellent sound design and thankfully Last Light does not disappoint. Traveling through dark tunnels infested with mutated creatures carries a sense of the unknown as you can hear rubble shifting around you and any time the game does enter spooky territory, it never does so with a simple jump-scare. In fact, the best moment in the game saw unintelligible whispering growing to a fever pitch as I explored an area where obviously many men had lost their lives, and it truly felt as if the souls of those dead were whispering their scorn to the living who had intruded upon the place where they breathed their last. Metro: Last Light hasn’t changed too much in gameplay structure, however it has been given a number of balance shifts which will please newcomers but may put off some veterans. At its core Last Light is a first person shooter with stealth elements and a hint of survival aspects added in. In this sequel each of these mechanics have been revamped for the better, but also for the worse. 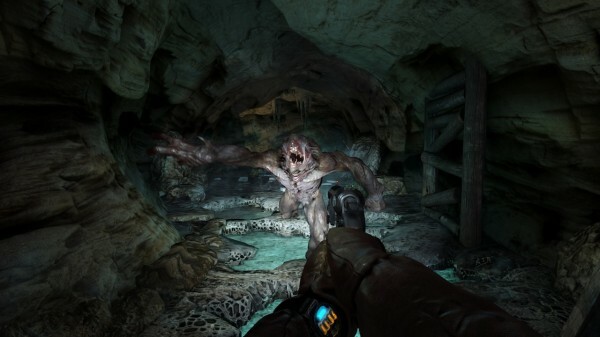 In Metro 2033, taking on a group of enemies would likely mean your death if you didn’t play smart, however now in Last Light it is entirely possible to take out every enemy you come across through simple gunfire, since players now have access to quite a lot of ammunition, can survive more damage with regenerating health and carry five health packs and many of the weapons in the game have seen a damage boost to the point where enemies can be dropped in a few shots. However while it is possible to run and gun your way through the game, it isn’t quite as fun as the alternative. While stealth isn’t necessary, it is now possible to create tackle any encounter you come across with both stealth and gunfire. This is thanks to the fact that the lighting mechanics in Last Light play a major fact in stealth, allowing players to blow out candles/lamps, unscrew light bulbs, flip off circuit breakers or simply shoot out the lights, creating a dark playground for the player to hunt in. Players can silently eliminate enemies with throwing knives or up close with either a knife execution or knock out or even pick off enemies with silenced weaponry. In fact, stealth seems like it is in fact a bit over powered now in Metro: Last Light. While mutants you fight against cannot be taken down this way, nearly all human enemies are susceptible to player’s in stealth mode. Thanks to a handy watch indicator that reveals when players can be seen, it is very easy to avoid light sources and whenever the players are in the dark, they are practically invisible to enemy AI. So much so that players can execute enemies right beside one another without worrying about their situation. It also doesn’t help that silenced weaponry makes the player nigh-impossible to detect, especially with a silenced shotgun as odd as that sounds. When the player is discovered, the enemy AI reacts surprisingly realistic to the situation. They will activate headlamps, search where they saw the player last and if you fire at them from the dark, they will take random shots in your general direction, hoping to either get a lucky hit or drive you from cover. This also means of course you can fire from darkness in one spot, draw your enemies close and sneak to another area and open fire on them from a different angle, leaving them at your mercy. This means that although mutated creatures can be a bit difficult to fight at times, most combat encounters are quite easy to overcome and thanks to an overabundance of ammo, players will likely never feel the need to use Military Grade Rounds, of which there are also an abundance thanks to the numerous weapons laying around that players can sell off at various locations in the game if they so choose. It also doesn’t help that there is quite an overabundance of filters for the player’s gas mask so even with that the survival aspect has been limited greatly. It is worth noting that there are a number of side-objectives, though not specified in any way, that the player can finish in any given level as well as a handful of collectible notes that are scattered in each stage. These side-missions can be missed but if the player chooses to, they can travel back to any given level and replay it from the main menu. It is also worth noting that there is a “Ranger Mode” which does take away some of this overabundance, but even then it isn’t overly difficult to make your way through the game on this mode. Also this mode is only available for early buyers of the game or later DLC so it shouldn’t be relied upon. 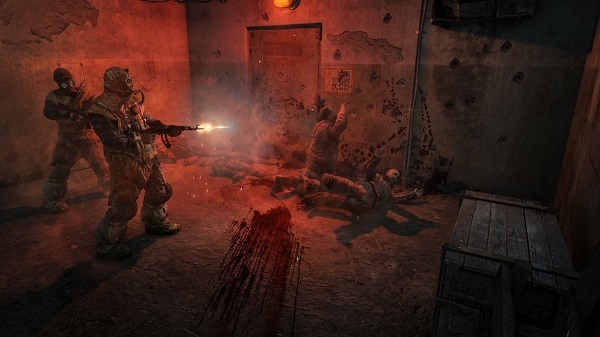 Metro: Last Light may have decided to go a safer route with its difficulty level by offering players some strong weaponry, enhancing the stealth aspects and an abundance of resources, but because of this it allows players to choose their paths through the Metro at will. Stealthily eliminating enemies or planning your next move is very enjoyable and thanks to great world building and an exceptional atmosphere, Metro: Last Light offers a haunting experience with excellent combat all taking place in one of the most memorable settings you’ll experience in quite some time.